Click on the following land trail areas on the image or scroll down for the list. Lake County’s untarnished landscapes and distinct seasons provide opportunities for a range of activities by land, water and air. Though its wild and scenic vistas appear remote and distant from large cities, the region’s southern border is only two hours away from the Golden Gate Bridge, 20 minutes to Napa Valley, and 45 minutes from the bustling city of Santa Rosa. We’re 1 1/2 hours from Sacramento Airport, and 2 1/2 hours from San Francisco. So you’re never far away from solace to renew and envigorate your spirit! The southern border is flanked by Robert Louis Stevenson State Park, extending to three counties – Sonoma, Lake and Napa – and managed by the Napa Parks OSD. The five-mile fire road leading to the summit is a challenging hike, and other trails heading east toward the Palisades offer majestic views of the Napa Valley and sheer rock cliffs jutting over oak woodlands and sprawling vineyards. Just north of it, the 3,500-acre Boggs Mountain Demonstration State Forest (BMDSF) offers a forested canopy for hikers, mountain bikers and equestrians with over 23 miles of flowing, single track trails. To the east, Bureau of Land Management (BLM) lands are extensive, and include the Cache Creek Natural Area of about 75,000 acres (including state and county lands), which also encompass the Cache Creek Wilderness Area of 27,245 acres. The BLM Knoxville Recreation Area of approximately 17,700 acres attracts off-highway vehicle (OHV) enthusiasts, and the BLM Indian Valley/Walker Ridge Area offers an abundance of recreational possibilities. Rolling chaparral hills dotted with oak and pine make an ideal setting for hunting, camping, bicycling, hiking, and equestrian use. Popular game animals include blacktail deer, black bear, quail, dove, and wild turkey. For wildflower enthusiasts, pockets of the rare Indian Valley Brodiaea and Adobe Lily can be found within the area. 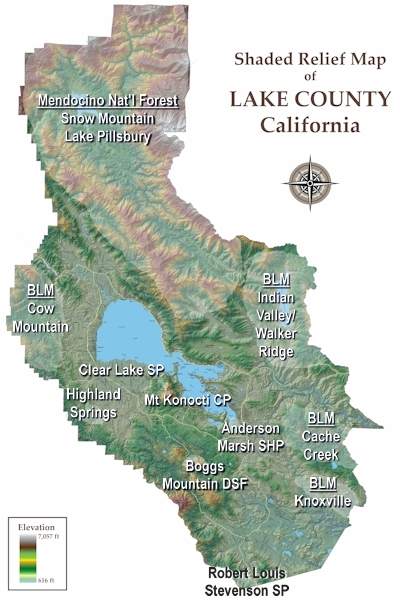 Extensive lands of the Mendocino National Forest (MNF) cover the northern boundary, and about half of the total acreage, or 450,000 acres, is located in Lake County. Included in this area is the 37,679-acre Snow Mountain Wilderness, its rugged and majestic scenery dominated by East Snow Mountain Peak at 7,056 feet. The area is a backpacker’s and horseback rider’s delight with numerous creeks and wide open spaces of chaparral, grasslands, oak woodlands, and deep forests. In the winter, cross-country skiers and snowboarders looking to escape ski resort crowds will find refuge in this pristine wilderness. The Lake Pillsbury Recreation Area offers nearly 200 developed campsites along the shoreline, providing captivating views of the lake against the high peaks, and a wide variety of recreational activities on and around the lake. The Middle Creek Nature Area, located in Upper Lake, consists of several hundred acres in reclaimed wetlands historically used for rice farming. Boasting one of the largest blue heron rookeries in Lake County, the bucolic setting – as part of the migratory bird route – is a haven for birdwatching. The western lands include the 52,000-acre rugged Cow Mountain Recreation Area: North Cow Mountain is reserved for non-motorized use (foot, bike and horse only), and South Cow Mountain (about 28,000 acres) is open to OHV as well as non-motorized use. These areas consist mostly of steep, chaparral-covered slopes with scattered stands of fir, pine and oak. The County-owned Highland Springs Recreation Area (HSRA) encompasses about 3,200 acres around two picturesque reservoirs. As the area is close to residential areas, it is a favorite destination for anglers, paddlers, equestrians, hikers, bikers, and disc golf players. Looking east, the majestic peaks of Mt Konocti County Park dominate the horizon. Hugging the shoreline below are the campsites and marinas at Clear Lake State Park, which along with Anderson Marsh State Historic Park, is a fabulous area for birding.